Evaporation is a process by which water is transformed from liquid to gaseous state. Heat is the main cause for evaporation. Movement of air replaces the saturated layer with the unsaturated layer. Hence, the greater the movement of air, the greater is the evaporation. Wind speed: A high wind speed removes the saturated air from the evaporating surface and replaces it with dry air which favors more evaporation. Whenever there is a combination of high temperature, very low relative humidity and strong winds, the rate of evaporation is exceptionally high. This leads to dehydration of soil to a depth of several inches. Air Pressure: Evaporation is also affected by the atmospheric pressure exerted on the evaporating surface. Lower pressure over open surface of the liquid results in a higher rate of evaporation. Composition of water: Evaporation is inversely proportional to salinity of water. Under similar conditions, ocean water evaporates about 5% more slowly than fresh water. More evaporation by plants: Water from plants generally evaporates at a faster rate than from land. The transformation of water vapour into water is called condensation. Condensation is caused by the loss of heat (latent heat of condensation, opposite of latent heat of vaporization). When moist air is cooled, it may reach a level when its capacity to hold water vapour ceases (Saturation Point = 100% Relative Humidity = Dew Point reached). Then, the excess water vapour condenses into liquid form. 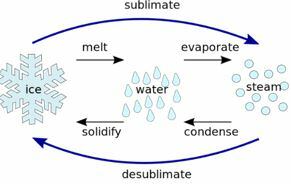 If it directly condenses into solid form, it is known as sublimation. In free air, condensation results from cooling around very small particles termed as hygroscopic condensation nuclei. Particles of dust, smoke, pollen and salt from the ocean are particularly good nuclei because they absorb water. Condensation also takes place when the moist air comes in contact with some colder object and it may also take place when the temperature is close to the dew point. Condensation, therefore, depends upon the amount of cooling and the relative humidity of the air. After condensation the water vapour or the moisture in the atmosphere takes one of the following forms — dew, frost, fog and clouds. Condensation takes place when the dew point is lower than the freezing point as well as higher than the freezing point. These processes can be studied under the” headings, adiabatic and non-adiabatic. When the air rises, it expands. Thus, heat available per unit volume is reduced and, therefore, the temperature is also reduced. Such a temperature change which does not involve any subtraction of heat, and cooling of air takes place only by ascent and expansion, is termed ‘adiabatic change’. The vertical displacement of the air is the major cause of adiabatic and katabatic (cold, dense air flowing down a slope) temperature changes. Near the earth’s surface, most processes of change are non-adiabatic because horizontal movements often produce mixing of air and modify its characteristics. Non-adiabatic processes include cooling by radiation, conduction or mixing with colder air. The air may be cooled due to loss of heat by radiation. In case there is direct radiation from moist air, the cooling produces fog or clouds, subject to presence of hygroscopic nuclei in the air. Cooling by contact with a cold surface produces dew, frost or fog depending on other atmospheric conditions. But the effect of cooling produced by radiation, conduction and mixing is confined to a thin layer of the atmosphere. The non-adiabatic processes of cooling produce only dew, fog or frost. They are incapable of producing a substantial amount of precipitation. The forms of condensation can be classified on the basis of temperature at which the dew point is reached. higher than the freezing point. 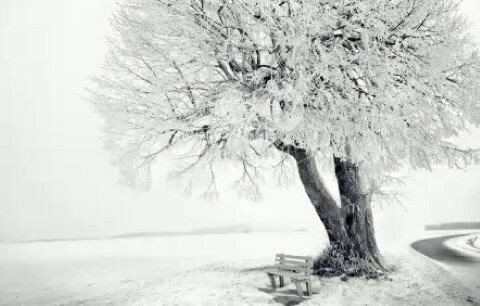 White frost, snow and some clouds (cirrus clouds) are produced when the temperature is lower than the freezing point. Dew, fog and clouds result even when the temperature is higher than the freezing point. Forms of condensation may also be classified on the basis of their location, i.e. at or near the earth’s surface and in free air. 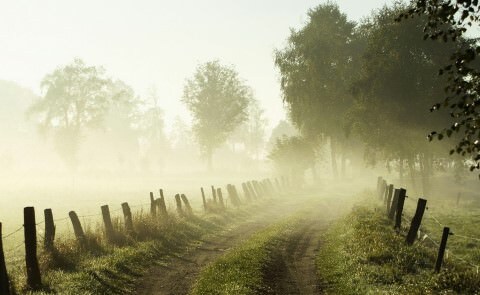 Dew, white frost, fog and mist come in the first category, whereas clouds are in the second category. 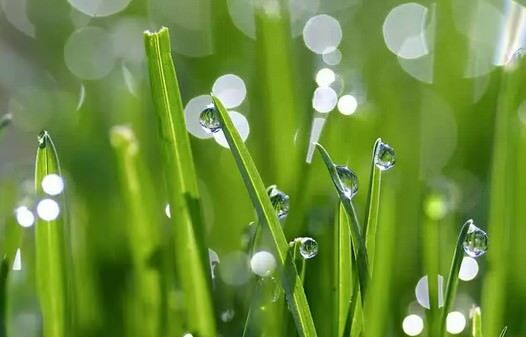 When the moisture is deposited in the form of water droplets on cooler surfaces of solid objects (rather than nuclei in air above the surface) such as stones, grass blades and plant leaves, it is known as dew. Frost forms on cold surfaces when condensation takes place below freezing point (0° C), i.e. the dew point is at or below the freezing point. The excess moisture is deposited in the form of minute ice crystals instead of water droplets. The ideal conditions for the formation of white frost are the same as those for the formation of dew, except that the air temperature must be at or below the freezing point. When the temperature of an air mass containing a large quantity of water vapour falls all of a sudden, condensation takes place within itself on fine dust particles. So, the fog is a cloud with its base at or very near to the ground. Because of the fog and mist, the visibility becomes poor to zero. Radiation fog results from radiation, cooling of the ground and adjacent air. These fogs are not very thick. Usual in winters. 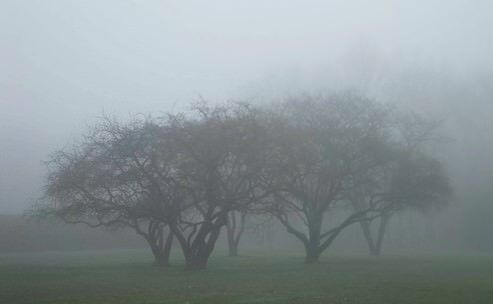 Fogs formed by condensation of warm air when it moves horizontally over a cold surface, are known as advectional fog. These fogs are thick and persistent. Occurs over warm and cold water mixing zones in oceans. Frontal or precipitation fog is produced due to convergence of warm and cold air masses where warm air mass is pushed under by the heavier cold air mass. Precipitation in the warm air mass condenses to produce fog at the boundary of the two air masses. These are called frontal or precipitation fog. In fog visibility is less than one kilometer. The difference between the mist and fog is that mist contains more moisture than fog. In mist each nuclei contains a thicker layer of moisture. Mists are frequent over mountains as the rising warm air up the slopes meets a cold surface. Mist is also formed by water droplets, but with less merging or coalescing. This means mist is less dense and quicker to dissipate. Fogs are drier than mist and they are prevalent where warm currents of air come in contact with cold currents. In mist visibility is more than one kilometer but less than two kilometres. Haze is traditionally an atmospheric phenomenon where dust, smoke and other dry particles obscure the clarity of the sky (No condensation. 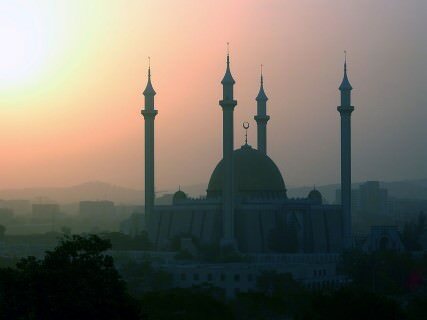 Smog is similar to haze but there is condensation in smog). Sources for haze particles include farming (ploughing in dry weather), traffic, industry, and wildfires. We will study about smog in detail in the next post. Clouds are caused mainly by the adiabatic cooling of air below its dew point. As the clouds are formed at some height over the surface of the earth, they take various shapes. 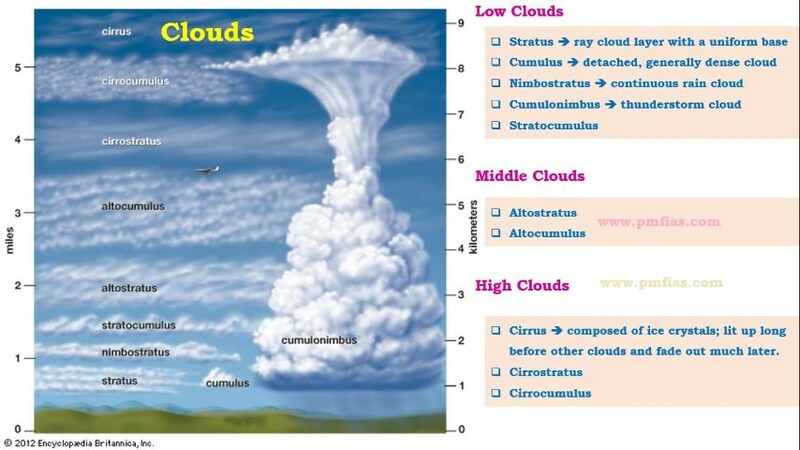 According to their height, expanse, density and transparency or opaqueness clouds are grouped under four types : (i) cirrus; (ii) cumulus; (iii) stratus; (iv) nimbus. Cumulus clouds look like cotton wool. They are generally formed at a height of 4,000 -7,000 m. They exist in patches and can be seen scattered here and there. They have a flat base. As their name implies, these are layered clouds covering large portions of the sky. 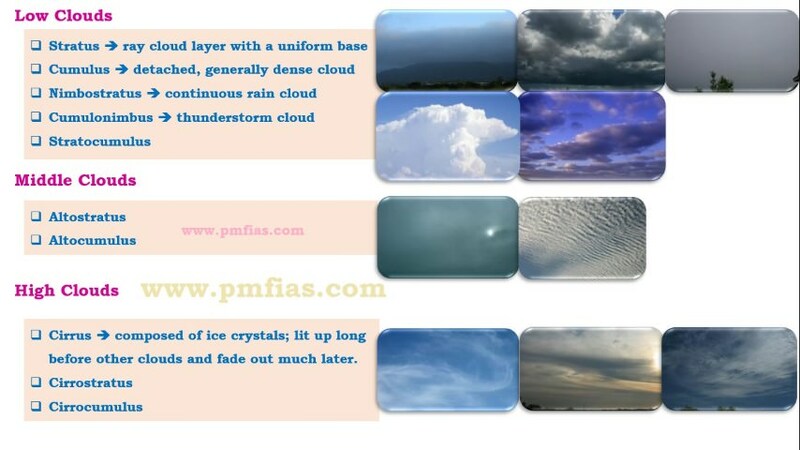 These clouds are generally formed either due to loss of heat or the mixing of air masses with different temperatures. Nimbus clouds are black or dark gray. They form at middle levels or very near to the surface of the earth. These are extremely dense and opaque to the rays of the sun. Sometimes, the clouds are so low that they seem to touch the ground. Nimbus clouds are shapeless masses of thick vapour.